This post is inspired by my umpteenth conversation with a friend who’s been shocked to find out that Moroccanoil — a hair treatment whose bright turquoise publicity material seems to grace half the beauty salons in Britain — is actually Israeli. In fact, I’ve even come across people who actively sought out Moroccanoil, deceived by its name into thinking they were buying a North African product. Yes, the argan oil that is a key ingredient to the product is from beans sourced in Morocco (apparently). And it is North African Arab and Berber women who have used the oil for many years as a skin and hair treatment. But the product called Moroccanoil — and some other argan-oil based hair treatments — is actually manufactured in Israel (and only contains a proportion of the raw oil, combined with lots of the nasties that go into most other mainstream cosmetics). Moroccanoil’s Israeli links, however, take a back seat on the company’s website. The product’s origin only is mentioned just twice on that site . One is tucked away in the terms and conditions section. For most people, of course, being inspired by a holiday experience means finding a new food or putting a photo on Facebook. In this case, it meant buying the entire company. As a result, the overall firm is Moroccanoil Israel, despite the fact that most of the contacts named are in North America and Europe. There have, of course, been references to Moroccanoil on Israel boycott websites such as BDSList for some time. 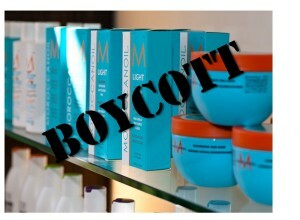 And Moroccanoil has been targeted by local campaigners, such as those in Ireland who urged hairdressers in the Limerick area to boycott the company’s products during the 2014 attack on Gaza. 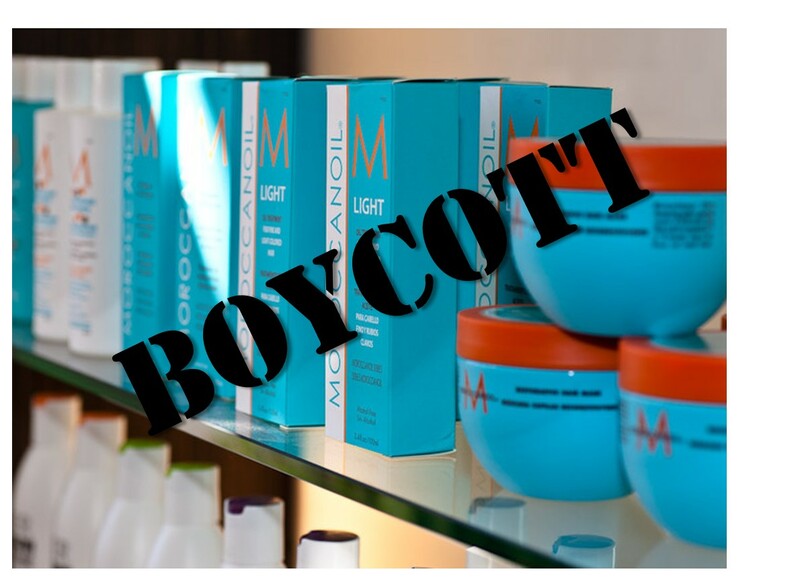 But I wanted to flag up three particular reasons why I feel that Moroccanoil deserves a higher place on boycott campaign lists. Firstly, there is its place in hasbara. Often translated as “explaining,” hasbara is the term that Israel uses for its propaganda activities. Pinkwashing and greenwashing are terms familiar to many activists. They involve portraying Israel as gay and environmentally-friendly in an attempt to distract from its apartheid system. Moroccanoil is something like “foundation-washing” — applying a thick cosmetic layer to the state’s crimes. In the lifestyle and careers sections of magazines, the company, its products and its owner are portrayed as a glamorous, associating Israel with beauty and luxury instead of discrimination and occupation. For that reason, Moroccanoil can be viewed as a form of hasbara. The hasbara extends to the trips which the company’s top sales reps get — to Israel, of course. For example, a video posted by Yariv Hen, head of IsraeliGuide, a tour company that organized one of those trips, shows Moroccanoil staff partying in a range of settings, including some which may be on Israeli settlements in the occupied West Bank or Golan Heights. Secondly, like other “beauty” brands such as Dove, Moroccanoil exploits the language of inspiration and empowerment to convince women to buy their products. Moroccanoil’s website uses interviews with women involved in social volunteering, renewable energy and animal rights campaigning to greenwash the fact that the product itself has links to an oppressive, exploitative regime. And thirdly, there is the fact that in calling its products Moroccanoil, the company seems to be deliberately disingenuous, laying claim to an identity which — if it has any links to Israel at all — is to the country’s marginalized North African Jewish communities, not to the rich elites who make money from international trade. This is, perhaps, the perfect irony. Written by Sarah Irving. Originally published 26 June 2015 on The Electronic Intifada, as part of its Activism and BDS Beat. Moroccanoil is sold internationally at salons, online vendors, and department stores such as Nordstrom. i knew it was hype from the beginning- argan- properly arqan- means something like highlands in arabic- the tops of mountains– i figured it was olive oil from the mountains… i would be interested to know which bean it comes from- oil from beans? soy? gmo? and whatever else you have discovered about ‘argan oil’. Argan oil is a popular ingredient in cosmetic goods and is produced from the kernels found inside the argan nut, part of the fruit from the argan tree native to Morocco. Israel technology has also bred a variety of the tree for cultivation in Israel. But the key here is that the company Moroccanoil–like other cosmetic brands featuring the oil–is based in Israel. And until Israel complies with international law and renounces its pattern of human rights abuse, products and services based in Israel are complicit and should be subject to bds. Argan is a tree that grows only in a region near the city of Agadir, Morocco. and ‘Argan’ is not an Arabic word, but Berber (the language of Amazigh pepole in Morocco). Argan has olive like shape,it fruit is 2–4 cm long and 1.5–3 cm broad, with a thick, bitter peel surrounding a sweet-smelling but unpleasantly flavored layer of pulpy pericarp. This surrounds the very hard nut, which contains one (occasionally two or three) small, oil-rich seeds. The fruit takes over a year to mature, ripening in June to July of the following year. Thank you for informing me about this product. I always buy this particular brand and had no idea about its Israeli ties. I will now completely cease buying their products and will tell all my friends and family to stop as well. Thanks again!! When BDS asks for a boycott does it mean ALL products or just most of them? Its almost impossible to keep up and now Morrocan Oil is on the list, a product I use religiously. I had no idea they were Israeli, thought they were either European or N. American. Giving up this product would be a problem right now so I don’t know. I do think they were hiding, not because of the name Morrocan Oil (argan oil is from Morroco) but because they make it impossible to realize the company is based in Israel. BDS is a strategy not a principle. The more you boycott Israeli companies and campaign against institutions that help Israel enforce its occupation and apartheid policies, the more pressure is felt by the government. Given the fabric of international commerce it’s almost impossible to boycott every product and company that has some involvement with Israel, so it is important that we take our lead from the BDS Palestine National Committee to focus our energy on targets (e.g. the successful targeting of Radiohead, just recently). These successful campaigns have greatly spread awareness of BDS and the criminal treatment of Palestinians it combats. The feel good factor that your money isn’t going to support apartheid is an added bonus.